Read this article to know everything about Nulliparity ovarian cyst. Though there are numerous types of ovarian cysts that occur in a woman's life span till almost to her menopausal days, most of them are functional, benign and non-cancerous. They may become extremely painful, cause excessive bleeding and behave critically but are seldom life-threatening. However, abnormal ovarian cells turning cancerous may prove lethal if not treated early or are ignored. Abnormal ovarian cysts are also unlike functional cysts as probably they are the result of abnormal cell growth. Besides, no one actually knows what have caused them to grow. Polycystic ovarian cysts are believed to arise on account of 'imbalance' in female hormonal growth while the chances of cysts turning cancerous become more pronounced after menopause. Studies also reveal that women from the affluent society where expected life span is rather long and in cases of nulliparity where delayed childbearing is more a rule than an exception, epithelial ovarian cancer is more common. Conversely, multiparity with prolonged use of birth control pills the chances are reduced. A reasonable explanation for this strange phenomenon could be the reduced ovulations. As each ovulation requires the rupture of the ovarian follicle and the consequential repair of the ovarian surface, it involves a reparative process, which tantamount increased cell divisions, or mitoses. These mitotic events or cell division consequences provide greater risk for cancer. However, some people tend to believe in folk lore and consider that use of talcum powder contaminated with asbestos dust is responsible for ovarian cancer while others claim that consumption of yogurt has a direct link with the disease condition. Genetic factors (5% to 10%) are thought to be linked with ovarian cancer to a great extent. In fact, studies have revealed that members in family with recorded cases of ovarian cancer coming down through generations may give rise to epithelial ovarian cancer in future generations. Doctors, as a rule advise such patients to remove their ovaries as a precautionary measure. The age limit for such cases has been fixed at 50 or earlier. But the worst part of the whole story concerns the tests or their results. Even if someone's cancer test turns positive, it may not mean that she will become a victim of the deadly disease. In other words, the person may or may not have cancer at all. Nulliparity should better not to be practiced to remain on the safe side for life. 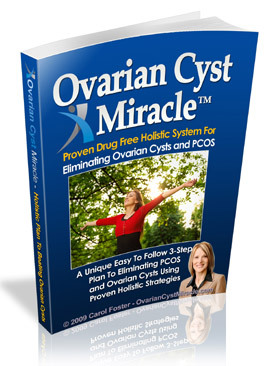 Absolutely any woman can have cysts in the ovary - it does not matter whether she has had a child or not. The fact is that cysts are quite normal. And as long as holistic remedies are there, they can be treated easily too. Yes, holistic remedies are more efficient than conventional medicines when it comes to ovarian cysts simply because they treat the body as a whole. Holistic remedies go deeper (rather than just treating the symptoms) and identify the real causes and when this is done, all these causes are treated individually. Because of this deeper approach, holistic remedies can more successfully treat the cysts in the woman. The best way to fight cysts is through holistic medications. These medications treat the body and the mind and approach the body as a whole and try to remove the fatigue and make the person healthier and refreshed. Because of this the natural immunity of the body is also improved and the person can fight diseases better. As opposed to this, conventional medicines just treat the symptoms and as a result, what caused the cyst is never known. Holistic remedies attempts to find out all the contributing factors of the cyst and then finds out ways to beat each one of them. Thus, the holistic approach is more scientific and it provides better results too.